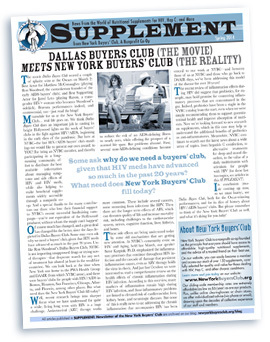 SUPPLEMENT: Newsletter of the New York Buyers’ Club is back again and feeling the love – thanks to those who made our recent indiegogo campaign a success! All articles are archived here on our blog, or you can download the printer-ready version. Some ask: Why do we need a buyers’ club, given that HIV meds have advanced so much in the past 20 years? What need does New York Buyers’ Club fill today? Shopping online with us is both secure and private. See how we scored! (Link will open independent website testing/security site) You can also verify current SSL security from our site. ThiolNAC is Back – and Remixed! ThiolNAC, custom-manufactured and available exclusively through New York Buyers’ Club, is back in stock after our recent and successful fundraising campaign – thank you! ThiolNAC is a combination of two powerful agents: N-Acetyl-Cysteine (NAC) and Alpha-Lipoic Acid (ALA). Recently reformulated, three ThiolNAC tablets per day now provide the same exact dose of these key antioxidants, used in Dr. Jon Kaiser’s groundbreaking 2006 study of HIV-positive patients undergoing antiretroviral therapy (ARV), which proved that a combination of micronutrients (vitamins, minerals, and trace elements) and antioxidants could boost CD4 counts (24%, on average). This formula subsequently became the basis for the very popular K-PAX®. With our new supply of ThiolNAC, the New York Buyers’ Club continues to offer a supplement combination of quality comparable to K-PAX named NYBC MAC Pack (for Multivitiamin-Antioxidant Combintation) – at less than half the price. Data show the benefits of NAC in conditions ranging from pulmonary problems to possibly reducing the potential for cancer cells to metastasize. Notably, NAC is effective in replenishing the body’s glutathione (sometimes called the “master antioxidant,” responsible for counteracting many damaging inflammatory processes). Individuals with HIV and other chronic infections often see a reduction in glutathione; by working to replace lost glutathione, NAC may help slow disease progression and lessen some medication side effects, particularly if used as part of a comprehensive plan for managing such symptoms and side effects (read: plays well with others!). Alpha-lipoic acid (ALA) is a liver protective agent, and has been studied for peripheral neuropathy and lipodystrophy. It may slow HIV replication, and counter HIV-related dementia. ALA is very important in several ways. It easily crosses cell membranes and works as anantioxidant in both lipid (fatty) and aqueous (watery) parts of the body. It is a versatile and powerful antioxidant, both reducing oxidative stress in the body, and indirectly protecting, recycling, or regenerating other major antioxidants. There is also good evidence that ALA has beneficial effects for those with type 2 diabetes and some of its complications. Its wide-ranging benefits for diabetes, according to recent research, include improved glycemic control, improved insulin sensitivity, as well as reduction of oxidative stress and neuropathy. Our colleague Lark Lands, an expert on supplementation for people with diabetes and people with HIV, has drawn our attention to the concern that alpha lipoic acid may produce symptoms of hypothyroidism in some people. Partly due to this concern, NYBC has also reduced ALA in our ThiolNAC, such that 3 tabs/day equals 400mg – below the dosages generally of concern in Lark’s analysis. Symptoms of hypothyroidism may include fatigue, low body temperature, weight gain, hair loss, splitting fingernails, depression, memory problems, muscle weakness, elevated cholesterol, and/or skin that is dry, rough or scaly. NYBC recommends monitoring the thyroid while taking ThiolNAC or ALA by itself. For more on ALA and the thyroid, click here.